Male male and female panel mount connectors from Binder have a black insulating body as standard. If multiple panel mount connectors are installed in the customer housing, it's difficult to distinguish them visually and it may be possible to mate them incorrectly - in the worst case this may destroy the connector. It is therefore important to be able to distinguish the different functions visually. 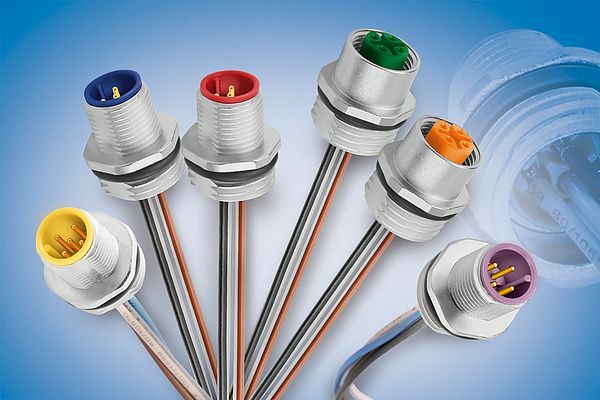 Effective immediately, we can supply our A-coded male and female panel mount connectors with single wires in six different colours. The standard wire length is 200 mm, but they can be supplied in any length required by the customer.The diagram uses a new numbering system.If required, B- and D-coded versions with single wires different housings and dip-solder contacts can be supplied. The lot size will be set initially at a minimum of 50 pieces.